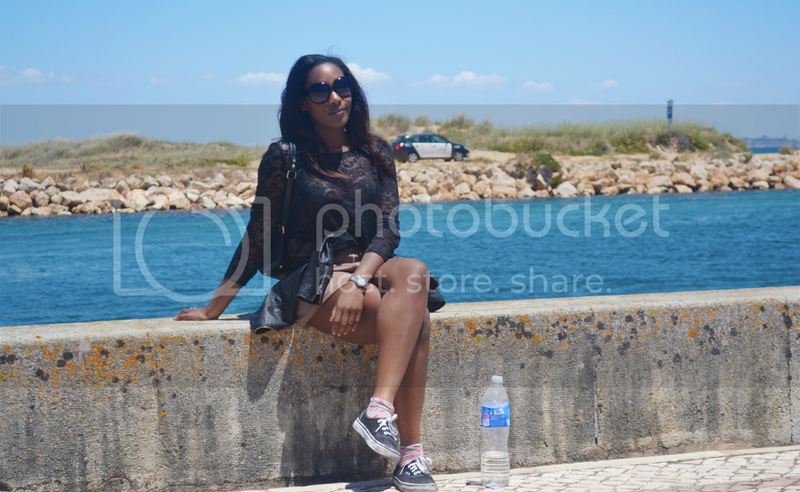 We took these photos on a day out exploring the old town in Algarve the day after we arrived in Portugal, hence you can see this outfit shot in a few different locations around the town. It wasn’t blazing hot until a day or two more into our holiday, so I decided on this 3-quarter sleeve lace top. The laced aspect of the top stopped me from getting too hot, and the 3-quarter sleeve ensured I was dressed appropriately for the weather. I was wearing a bandeau beneath the top so that it wasn’t exposing too much, for those that are a bit bustier you’ll definitely need to pay attention to the bandeau and continually adjust it; I definitely found myself having to adjust it a few times if it slipped down. I paired this top with a brown ASOS skirt which I think adds a bit of diversity to an otherwise monotone outfit; finishing the outfit off with these comfy Vans trainers, which were very ideal given we spent the day on our feet. Both in Portugal and Miami now this backpack has been my best friend, it’s tiny enough that you can fit all your essentials in it and forget you’re even carrying it. Now that I have unlimited time, over these two weeks I’m going to be working really hard on updating Skylish with a lot of good content! It’s extremely rare that I have all of this free time to myself so I’m very excited to get some genuine productivity in for something I’m really passionate about. Hope you guys like this outfit! I’m going to spend the rest of my evening drowning myself in some really trashy TV – Love Island. Have you been away this summer? Where did you go and how was it? 5 Responses to "Exploring the Old Town"
It definitely does haha, I get you.